Candahar is a hard map if you play the intended way, you would take the keep on the bottom left, and ally to the right and one more to the right again, set 2 allied Wazers into the top left keeps, play an ordinary game and give yourself 4000 gold, have an Extreme time! Candahar 6 is a 6 player skirmish map with 6 keeps and each has 2 outposts, play it any way you like. Candahar M is for online play, you can play anyway you like, my idea is to play with 2 friends and 2 Wazers in the top left corner, there are no outposts for you and your friends, good luck! 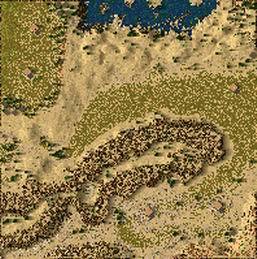 Two maps have the 2 spots in the top left corner and they each have 4 outposts, 2 of each, they can be a tough pair to remove from there and they will send a long run of troops your way, all of the maps will have the power bar, resources are unbalanced, only the top left corners are on high ground. I hope you enjoy my creations! ps: If you like to play online, there are some games being setup at strongholdnations, check the forums, feel free to join in! Thanks a lot Lord Dredde. I played it with a real player online and we had a fun game, I took the bottom left spot and he was beside me, we had a Caliph in the next spot and had 2 Wazers in the top left corner. In the beginning I was helping to keep from being overwhelmed, but once we got a moat dug and some range units in place things got a bit easier. I have seen a steady run of 2 colors coming from the AIs in the top 2 spots while playing on my own, my 2 allies were done, close to impossible to win from there!